I had a pint of blueberries in the fridge that were going nowhere fast. 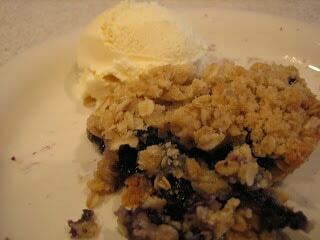 I didn’t want to waste them so I figured I’d whip up some type of blueberry crisp or cobbler for dessert. I looked through a lot of recipes and didn’t quite find what I was looking for so I created my own. I absolutely loved it and I’m sure this would be fabulous with any fruit!! 2. In a large bowl, gently toss together blueberries and white sugar; set aside. 3. In a separate large bowl, combine flour, oats and brown sugar. Cut in butter until crumbly. Press half of mixture in bottom of 8×8 baking dish. Cover with berries. Sprinkle remaining crumble mixture over berries. 4. 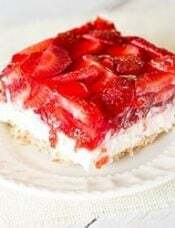 Bake in the preheated oven for 30 to 40 minutes, or until berries are bubbly and topping is golden brown. In a large bowl, gently toss together blueberries and white sugar; set aside. In a separate large bowl, combine flour, oats and brown sugar. Cut in butter until crumbly. Press half of mixture in bottom of 8x8 baking dish. Cover with berries. Sprinkle remaining crumble mixture over berries. 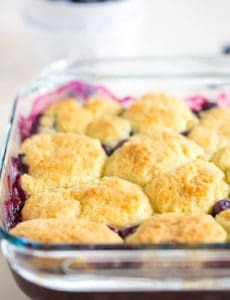 Bake in the preheated oven for 30 to 40 minutes, or until berries are bubbly and topping is golden brown. This looks so good! I’m planning on making it this weekend for a party. Just a few questions – can I make it ahead of time? and if I do, how should I store it? Also, did you serve this warm? Hi Angelyn, You really can’t make this ahead of time, it’s best to serve it warm. Once it cools and you reheat, the crisp topping will be rather soft. Enjoy! The taste of the butter overpowered everything. I’ll make it again with revisions: 1/2 cup butter (vs. 3/4), add 1 cup chopped walnuts w/the flour, oats, etc., add an addt’l 1/4 cup of oats + 1 tsp. of cinnamon. That should make the “crisp” a little more fluffy & light. But it’s a quick, easy recipe and, like you said, will work with so many other types of fruit. That looks great Chelley!! I want some. I heart crisps/cobblers – looks fabulous! yummm! that looks so good! i need to get some blueberries.